Any well-loved watch will need some form of restoration in its lifetime, if you wish to continue wearing and enjoying it. We are happy to carry out the appropriate and correct methods with our specialist team to ensure it is restored properly so that your watches value is preserved or possibly increased. When you bring your watch to us, you can rest assured that our team will look after it, whether it is nearly new or a vintage piece. 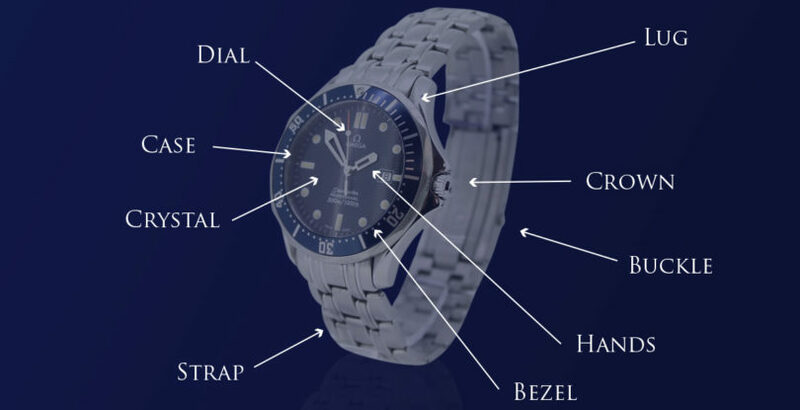 Our team of watch repair experts will carefully asses any work that needs to be carried out, but you would be forgiven not knowing the names for the parts of your watch – or what the restoration would entail. What does a watch restoration include? Case: We carry out an ultrasonic cleanse and polishing service for the case, and only carry this out with our highly-skilled specialist. When it comes to a vintage watch, we would rather advise you on the correct method for polishing the case or whether to at all, before proceeding to do so. Bracelet: Once more, we use the ultrasonic cleaning and polishing method to remove any scratches from the surface of the bracelet. However, if it is a vintage watch, we would recommend not to as this removes character and age from the watch, these features are highly-valued in the watch industry. Bezel: We cleanse and polish the face first, if required we can then to manufacture a new bezel with our specialised machine to create a fresh, youthful look. 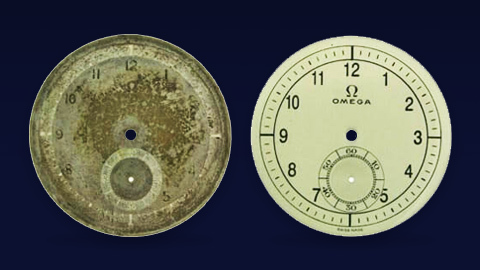 Dial: A strategic process is carried out to restore any watch dial. We take a picture of the original, strip it back to bare metal depending on the style, carry out any surface finishes to achieve the perfect paint, all original writing is re-applied once the paint has hardened, and then the batons are re-riveted to the dial. Each individual watch restoration project is unique; therefore, we prefer to evaluate the watch first and then determine what method is most appropriate, depending on what part of the watch needs restoring, or the age of the watch. Get in contact with us today, using our simple contact form below, to discuss your watch restoration project.